Stella Rosa is a sparking red Italian wine with low alcohol content of 5.5 percent. 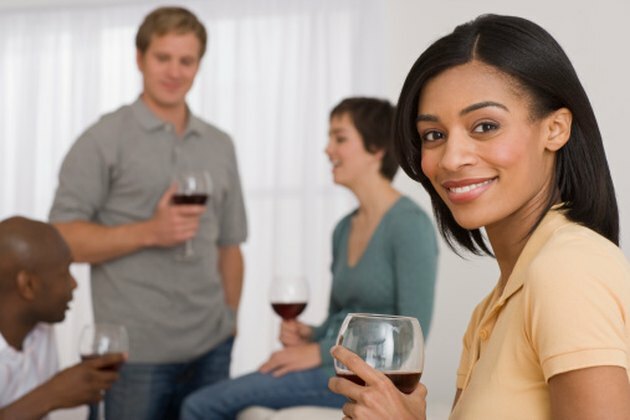 Wine aficionados consider it a good choice for those who are new to wine tasting. Stella Rosa wine is increasing in popularity, and is said to be a good wine accompaniment for cheese. Wine is formed from the fermentation of grapes. The byproduct of this fermentation is alcohol and water. According to the USDA, a 3.5 oz. glass of red wine nutritionally contains 91 g of water, 9 g of alcohol, .2 g of protein, .3 g of ash and 1.8 of non-carbohydrate substance such as glycerine, which is classed as being an alcohol. Wine is fat free and contains only trace amounts of protein. According to wine expert Lisa Shea, the caloric content of wine is attributed to its solely to its alcohol content. The number of calories for any wine is determined by the quantity or percentage of its alcohol content. The formula for the calculation of the caloric content for any wine is: 1.6 x percentage of alcohol x ounces of wine. According to this formula, a 3.5 oz of Stella Rosa wine, which has an alcohol content of 5.5%, would be calculated to have 1.6 x 5.5 x 3.5 = 30.8 or 31 calories. As with all alcoholic beverages, Stella Rosa wine must be consumed in moderation. The risk of alcoholism, liver disease, automobile accidents due to intoxication and dangerous drug interactions are just some of the health concerns associated with alcohol consumption. In addition, women who drink more than one glass of wine per day have an increased risk of developing breast cancer.